You have probably heard of “Esports” or “E-sports”, but have you heard of “fantasy esports”? Believe it or not, you can actually win money competing in fantasy leagues by choosing a team of fantasy e-sports pros, watch the games such as League of Legends or DOTA 2 and, most importantly, win money as your players deliver blow after blow to their opponents! And, we are not talking about chump-change either. 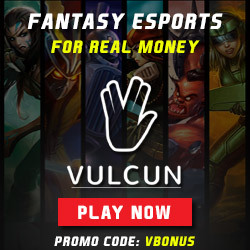 Some of the top fantasy esports sites online such as Vulcun or AlphaDraft are offering huge prize pools in the thousands and millions of dollars! Alphadraft can also stake claim to being at the top of the esports industry and have a strong ownership group to back up that claim. They are after all owned by Fanduel.com, the longtime giant in Daily Fantasy Sports. Alphadraft looks to bring the same success to their esports platform and they are off to a great start. Read our full Alphadraft review. You might have heard of Draftkings already for traditional fantasy sports like Football and Baseball. They are one of the biggest DFS sites in the world and have now dipped their toes into the fantasy esports industry. They have started offering League of Legends fantasy contests and we expect big things from them in the future for their esports offerings. Read our full Draftkings Esports Review. Draftpot is another daily fantasy sports site that like Draftkings is also offering LOL fantasy contests. They are a really unique site that are growing in popularity and prize pools. They have a huge array of contests available so if you like both DFS and Esports they are an excellent option. Read our full Draftpot Esports Review.